Maybe if I wrote lyrics like that I would have won a Noble prize? 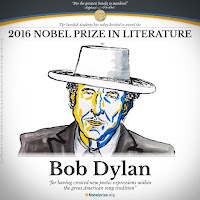 Bob Dylan did! 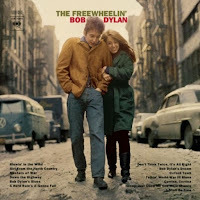 In the mid 1960’s Bob Dylan wrote many wonderful songs with poetic lyrics which were sometimes very bizarre. Some of his music and some of the lyrics were taken from older folk songs. No worries, as those songs were public domain at the time. 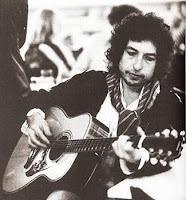 But most of Bob's songs were pure genius. 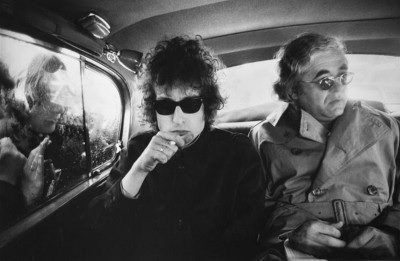 When manager/impresario Albert Grossman took him on as a client, it seemed like Dylan became famous overnight. Bob Dylan was probably not interested in what guitar he played. 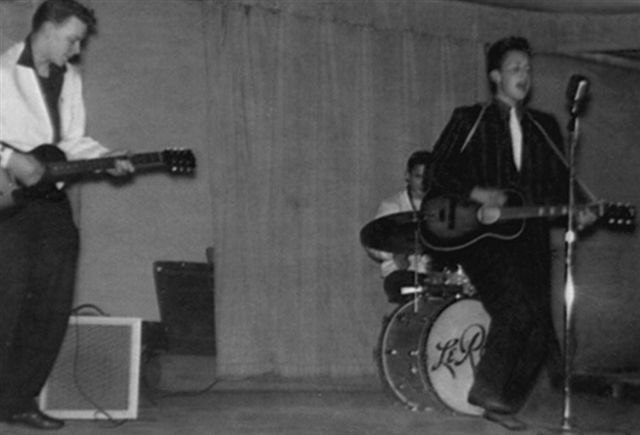 He even borrowed guitars on the spur of the moment at major concerts back in the day. 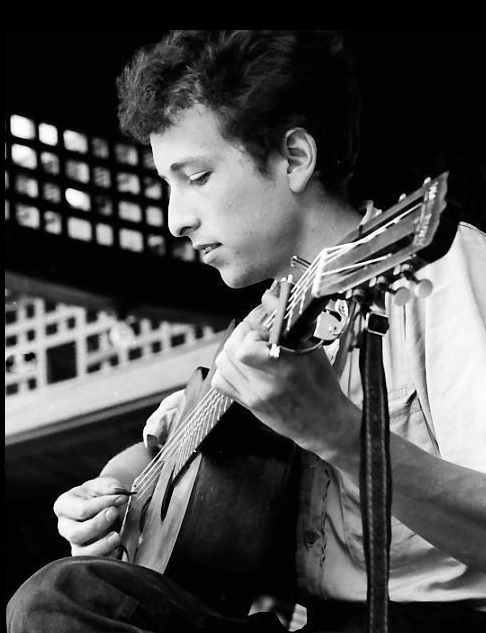 Dylan was all about the music and lyrics. However, he played and owned a variety of very interesting guitars. 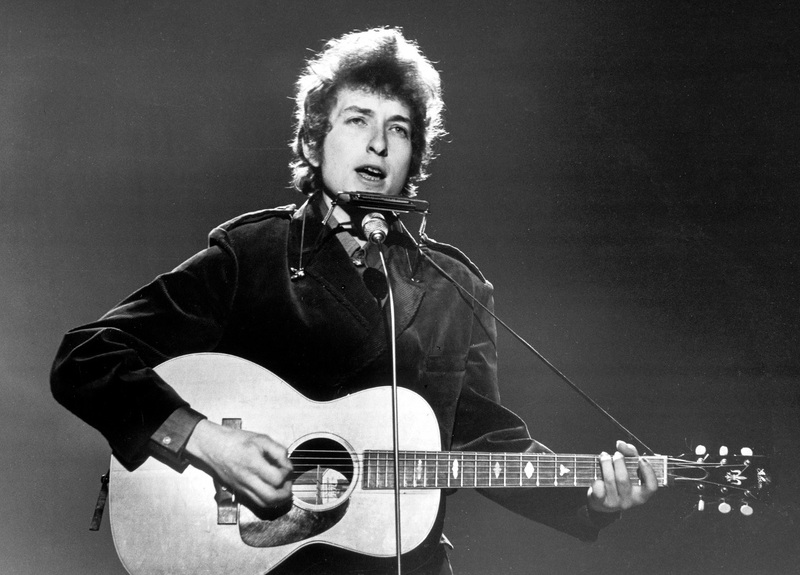 I've been a Dylan fan since I was a kid in the mid 1960's, so I thought it would be interesting to take a look at the guitars that Bob Dylan has used throughout his career. 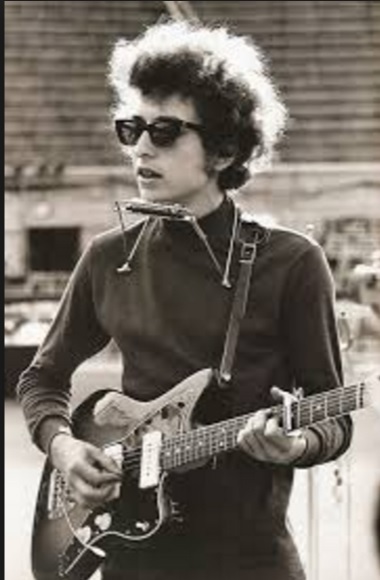 Bob Dylan’s first guitar was probably a cheap Silvertone Stella. This was not the Oscar Schmidt made Stella model, since the company had been acquired by Harmony Guitars of Chicago in 1939. 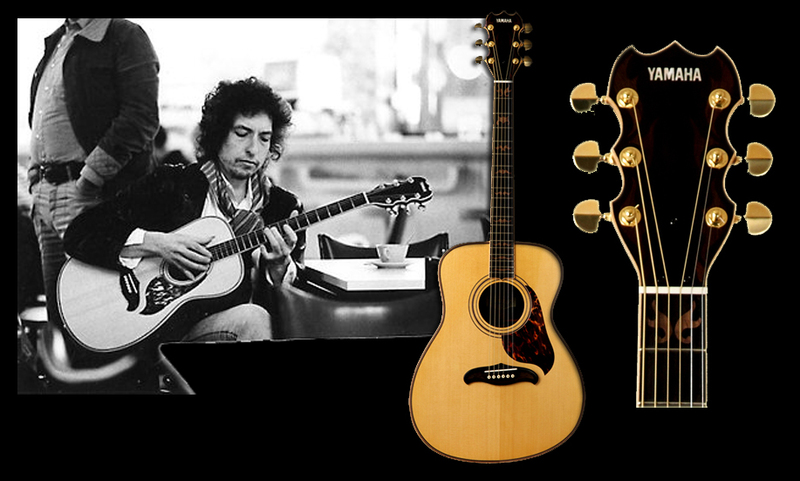 Bob's guitar was made by Harmony. The next guitar he is said to have owned was a Silvertone Aristocrat 642 Archtop. He played this in a high school talent show. It is currently on display at the Hibbing, Minnesota public library. Dylan's first decent guitar was a 1949 Martin 00-17 all mahogany guitar. He was probably inspired by his hero and mentor Woody Guthrie. Guthrie played "00" and small bodied guitars. 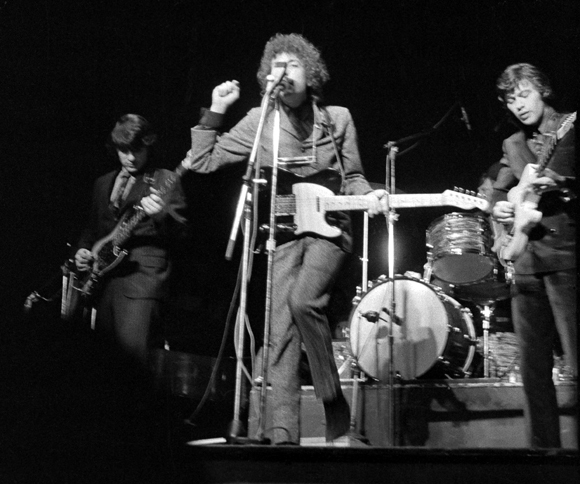 In pictures and videos of his early concerts Dylan is usually seen playing a small body guitar. This one look like it has been through the mill. 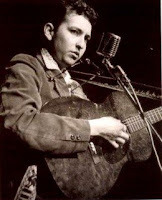 When he was a young man, Bob also made use of a 1950's Gretsch Ranger. 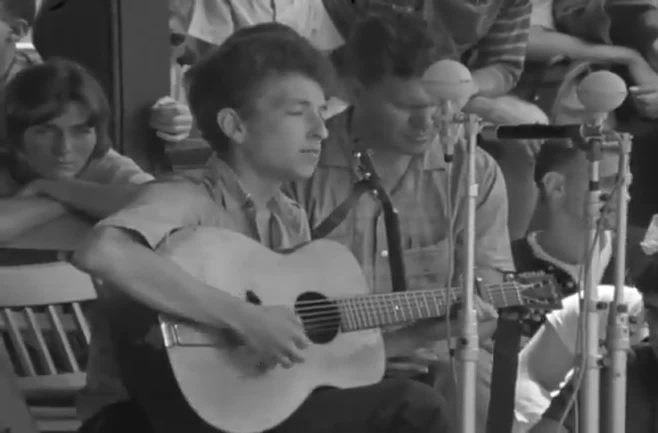 In 1963 Dylan showed up at the Newport Folk Festival with a Washburn model 5250. 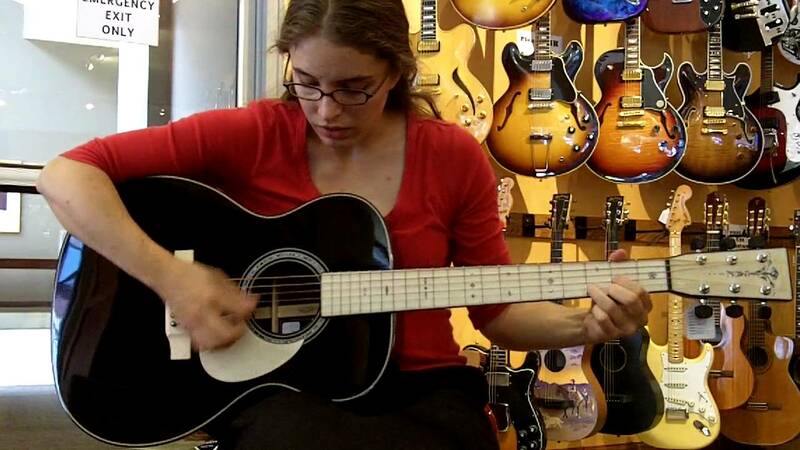 This guitar had a slightly arched top, with a round sound-hole. The strings went over a wooden bridge, that was held in place by the strings. Then the strings were secured to a trapeze tailpiece. 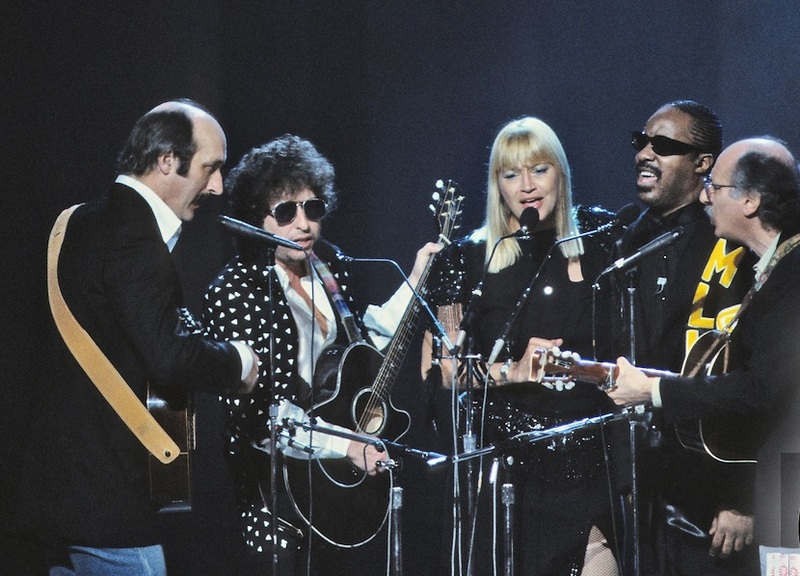 In a 1986 concert to honor Dr. Martin Luther King, Dylan showed up with another Washburn guitar. This time it was a Washburn Tanglewood. The Washburn 5250 was made in the USA by the Tonk Brothers, who made banjos and stringed instruments in the 1930's. The newer Washburn Tanglewood model was made in Asia. 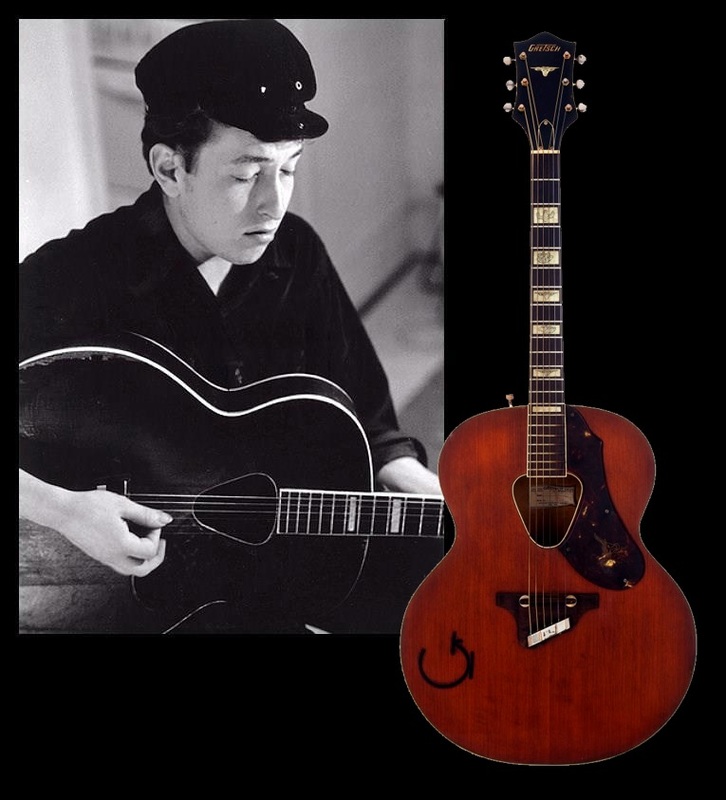 His next guitar was a late 1940’s Gibson J-50N. It must have been a model made after WWII because it does not have the Only A Gibson Is Good Enough banner. 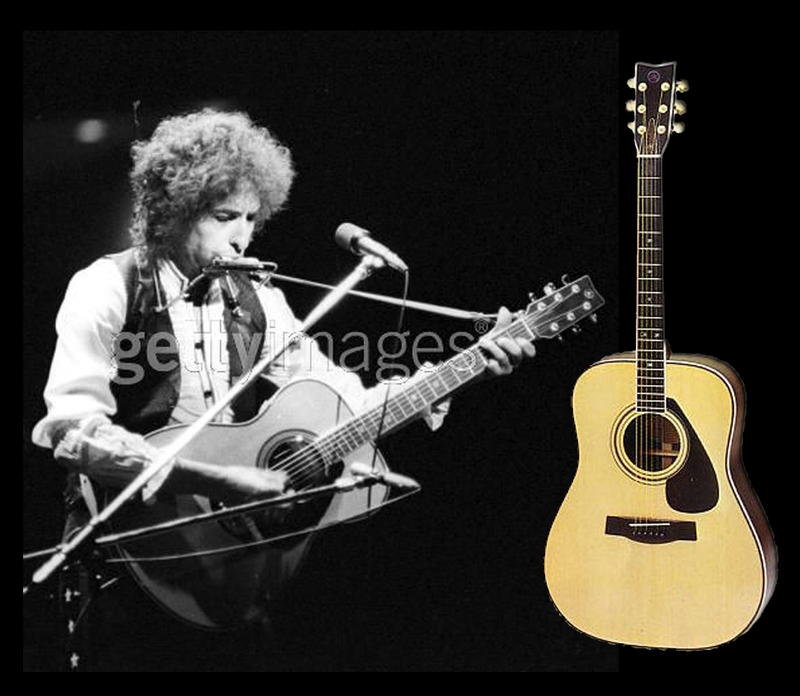 This guitar had a teardrop pickguard and is featured on the cover of “Bob Dylan”. This guitar was lost or stolen. 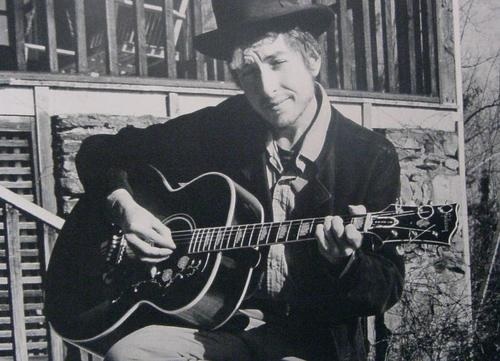 After losing the J-50, in 1963 Dylan purchased an early 1930’s Gibson Nick Lucas Special from a shop in New York City called Fretted Instruments. 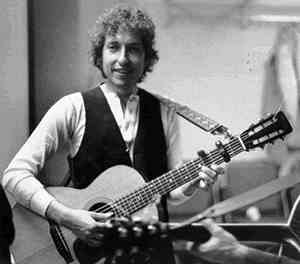 It was originally sunburst, but when Dylan got it, the guitar had been refinished blonde and the bridge had been replaced with one off a Guild guitar. The original Nick Lucas models from that era had trapeze tailpieces. Later models featured the belly bridge. 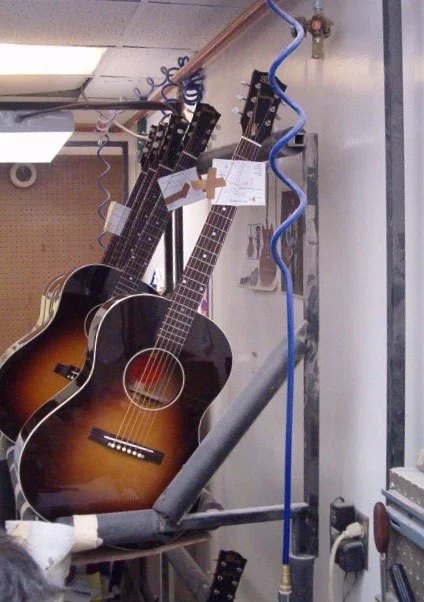 In 2006 a photographer was touring Gibson's Montana facilities when he spied two Gibson LG-1 with tags that had Dylan's name on them. 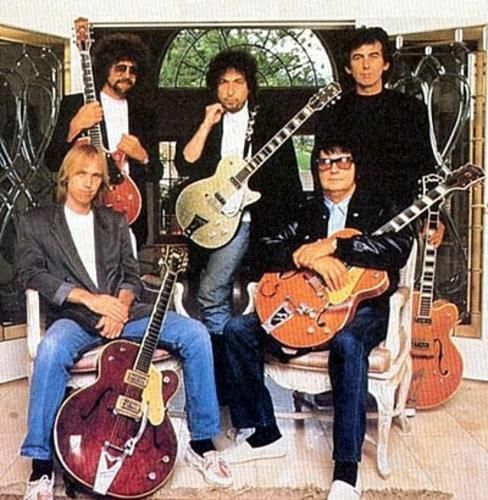 Bob had ordered the custom shop to build them, perhaps because he was so fond of the Nick Lucas guitar, which by the way was based on the LG-1 body with a 13 fret neck. Dylan borrowed a Martin 0-45 from Joan Baez, who he was dating at the time for a performance at the 1964 Newport Folk Festival. 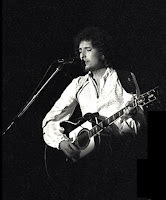 Dylan also owned several Gibson J-200 guitars that were played in concert. One was a gift from George Harrison. One was custom made by Gibson and it had a double pickguard. 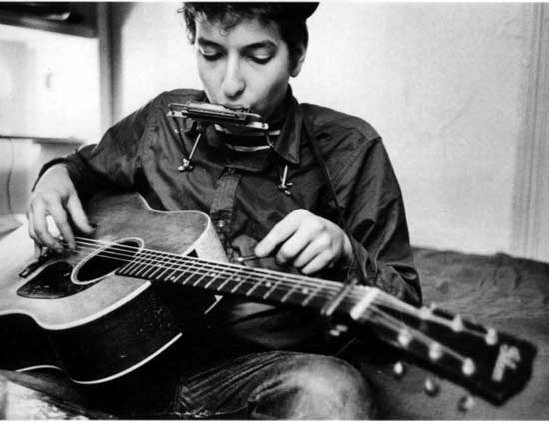 Bob Dylan was also fond of Martin 0-18’s and 000-18’s and can be seen playing both. In a 1974 concert to benefit the nation of Chile; a country in the midst of a revolution at the time. 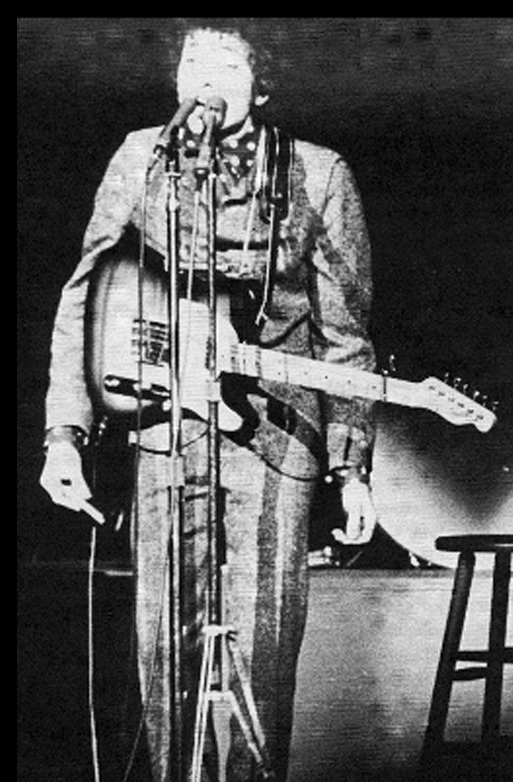 Dylan gravitated to the electric guitar in 1965. 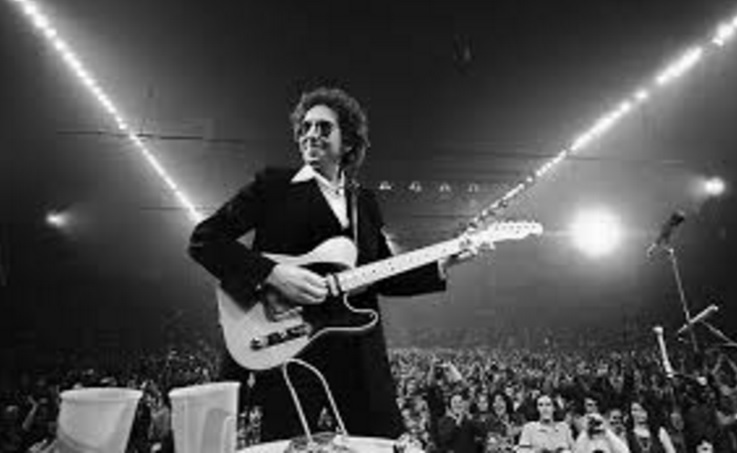 His image as the darling of the Folk Crowd instantly became tarnished when he took the stage with an early 1960's sunburst Fender Stratocaster to play Like A Rolling Stone. 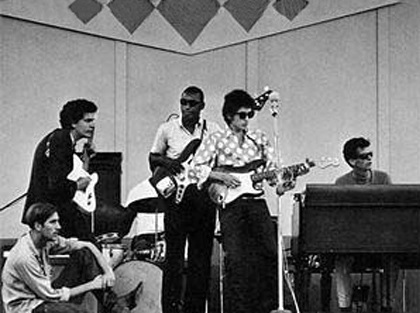 Some black and white photos from the session at the Colombia recording studio A, show Bob playing the Strat. 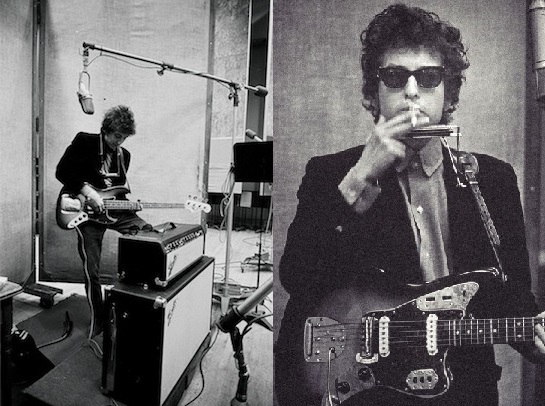 Possibly from the same photo shoot we also see him with a 1960's Fender Jazz bass, and a 1962 Fender Jaguar. 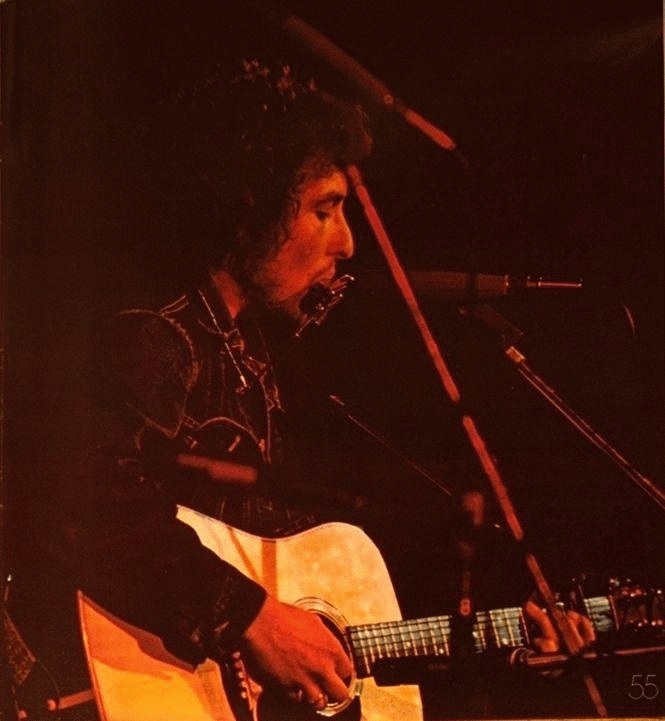 In a poster for the Bootleg Series Volume XII, we see Bob playing a Fender XII. 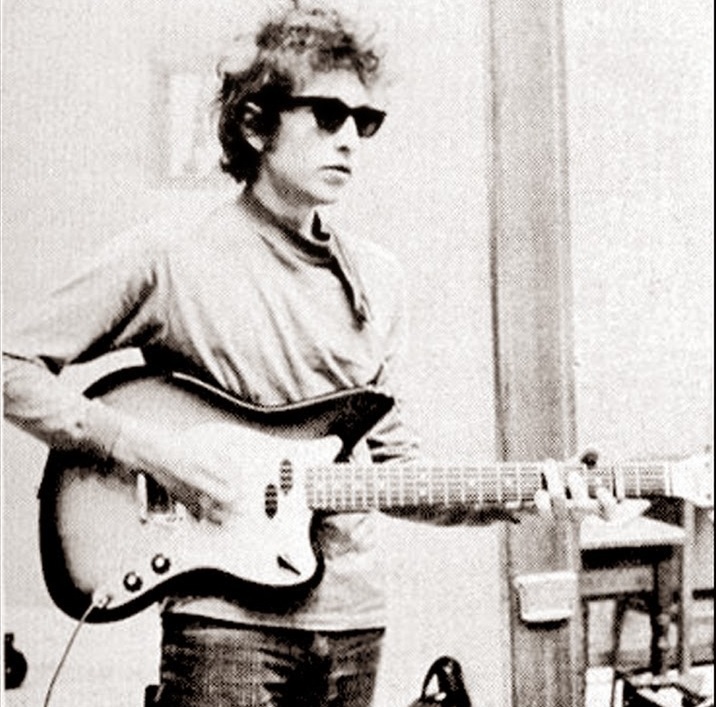 In another publicity photo Dylan is seen with a 1965 Fender Jazzmaster. 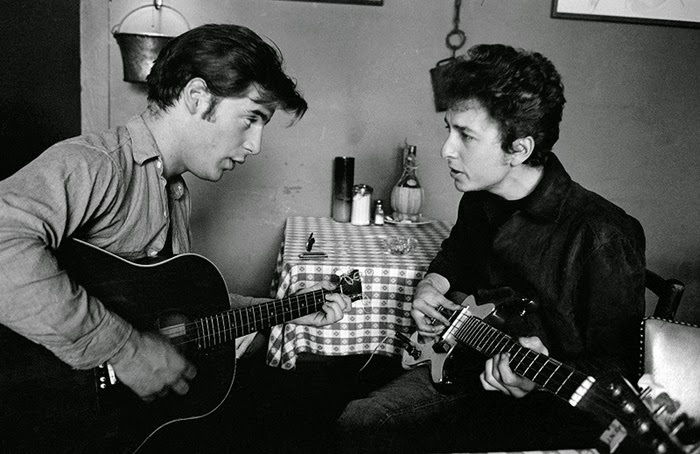 In another photo from the Bootleg series, Dylan is seated at what appears to be an Italian restaurant playing an off-brand Precision Bass copy while a young John Sebastian plays guitar. 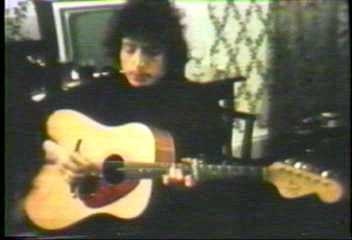 Dylan played some fairly odd guitars, including a 1966 Fender Kingman acoustic guitar. This was designed by Roger Rosmeisl and had a metal bar inside of it that went from the neck block to the end block. 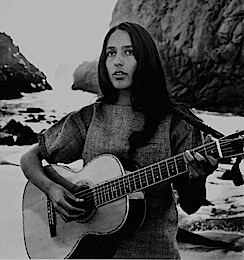 Fender discontinued this series of acoustic guitars in 1971. He also received a special Martin guitar through his guitar tech, Cesar Diaz. 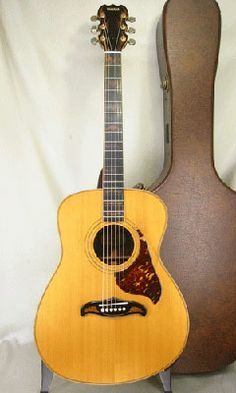 This was a Martin OM-28 Perry Bechtel model. 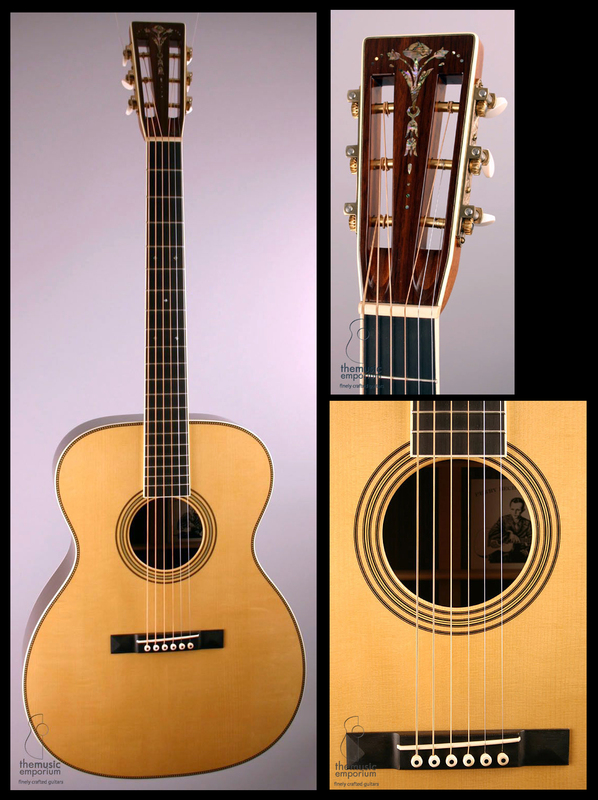 Bechtel was an entertainer in the 1930's and requested that Martin create the OM style guitar with the neck joining the body at the 14th fret. Note the pyramid bridge. Dylan also played a Martin D-28 at the Concert for Bangladesh and a HD-28 in the Rolling Thunder Revue. Bob utilized a Yamaha L-6 for the Budokan Tour. 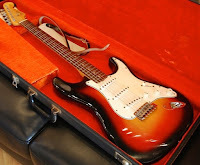 In 1978 he purchase three Yamaha L-51's at the Hong Kong airport. This guitar had an unusually shaped headstock. Then later on he used a black Yamaha L-52. The L-6 is a low end Yamaha, while the L-51 is a solid wood guitar with an unusual rippled headstock. 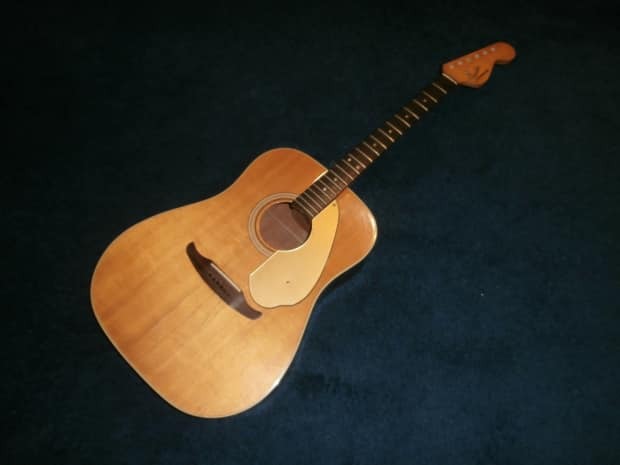 The L-52 model has a jumbo body, like a Gibson J-200, only with squared off upper and lower pickguards and a bridge similar to a Gibson Dove. This was a nice guitar, with cloud inlays on the ebony fretboard. Yamaha offered this model around 1972. 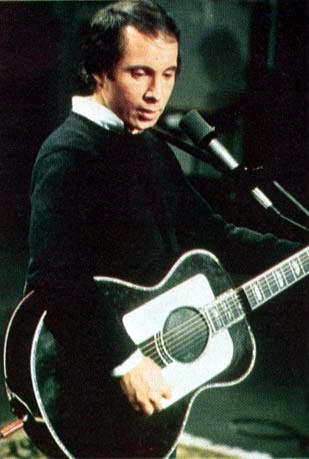 Paul Simon also used a similar guitar. Bob must have liked the look of the black Yamaha L-52, since around 2002 Martin came out with a Negative HD-28, which had a black body and a white neck and headstock. 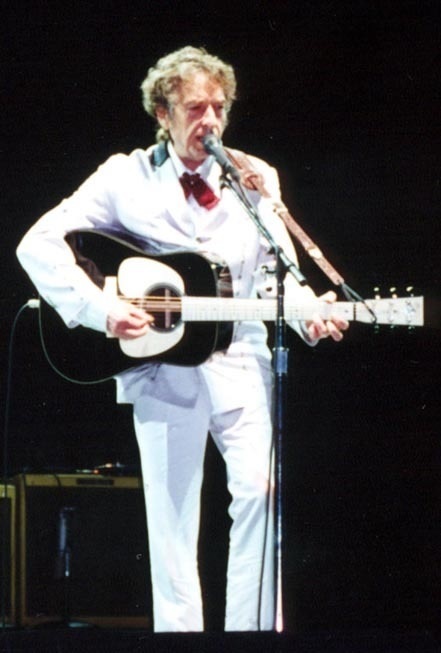 Dylan had one commissioned with twin white pickguards and used it in a 2002 concert. 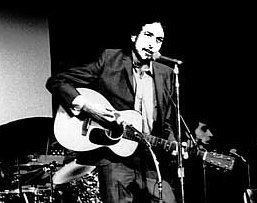 For as much trouble as the electric guitar caused for Dylan, he did not play it in concert as much as his acoustic guitars. His best known electric guitar would be the 1960’s sunburst Stratocaster that he played at the Newport Folk Festival in 1965, when he got booed while playing “Like A Rolling Stone”. 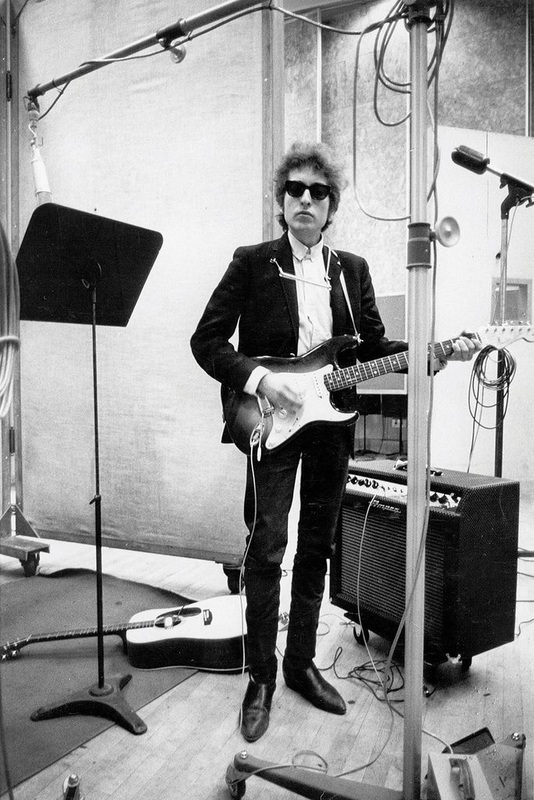 It was also featured in some early pictures of him in a recording studio. He only used it a few times and then it went missing. Dylan also played several Telecasters starting in 1965 with a sunburst model with his band called The Hawks. 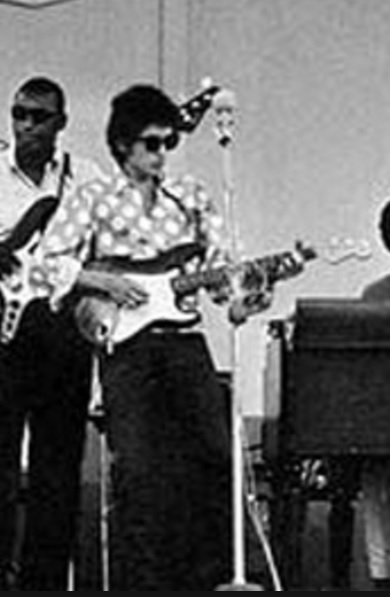 Later when he played with The Band he used a black model and a blonde model. 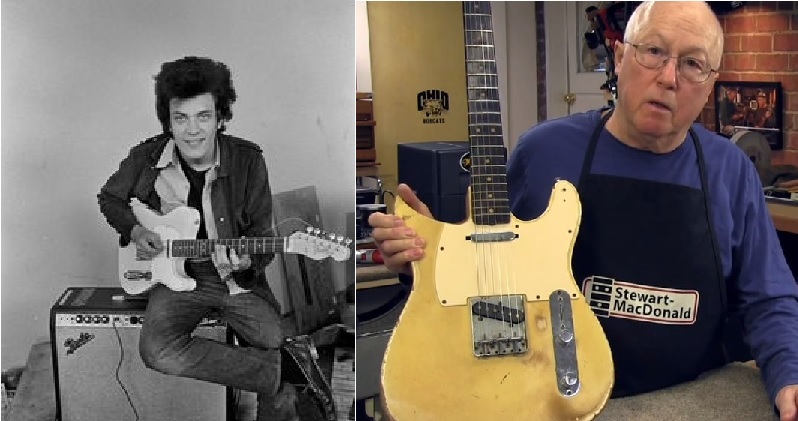 One of the more interesting guitars that Dylan is said to have played, but not owned, was Mike Bloomfield's 1963 Fender Telecaster. 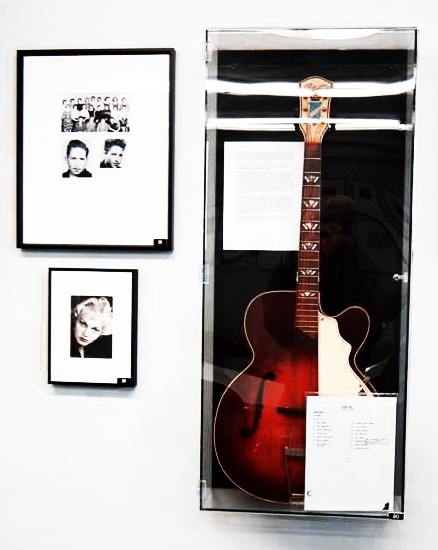 Bloomfield played this guitar before it went under the knife. 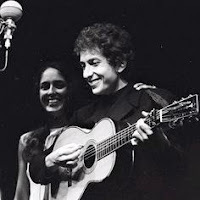 He used in on the original recording of Like A Rolling Stone, and in the Newport Folk Festival Concert where Dylan went electric and got booed off the stage. Bloomfield also recording those guitar licks on Highway 61 Revisited with this guitar and Dylan is said to have borrowed it during the recording sessions. 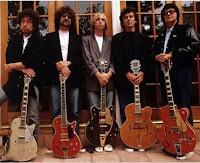 While in the Traveling Wilburys, Dylan sported this 1987 Kramer Ferrington bass guitar. 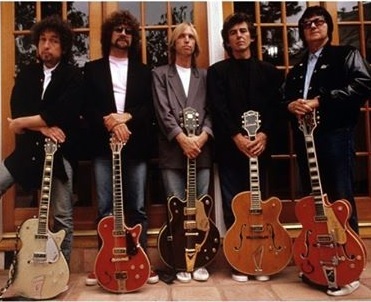 He is also seen with the Wilburys posing with this Gretsch Silver Jet. 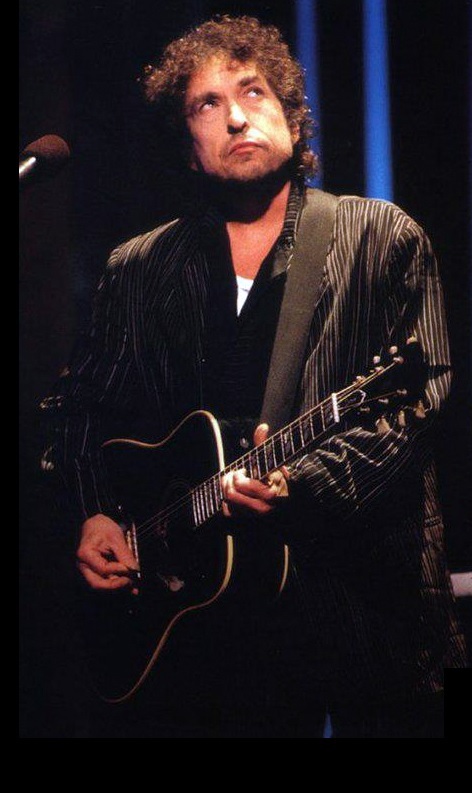 Around 1993 Dylan played a Gibson Hummingbird guitar in concert. 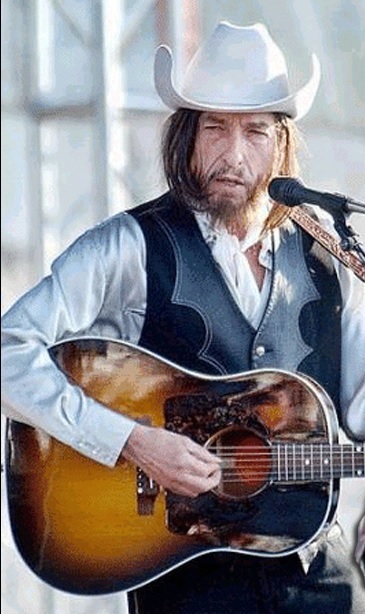 A year later Bob was using a Gibson Dove. 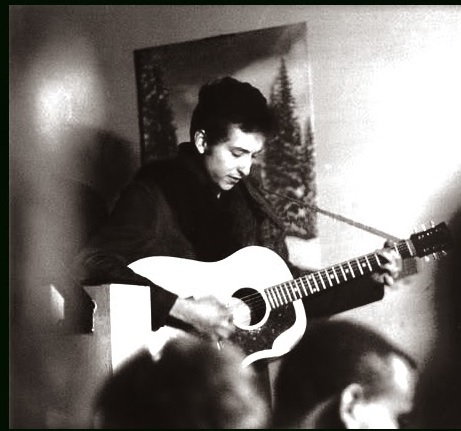 Dylan also owned a Gibson J-45 with twin pickguards. 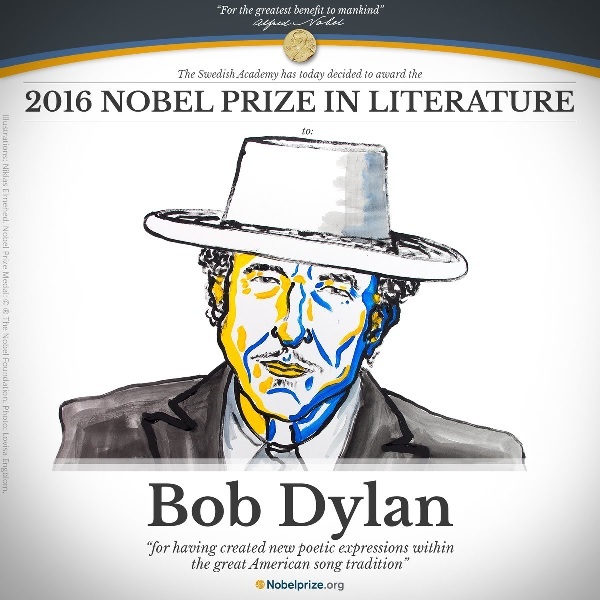 In 2016 Bob Dylan was honored as the recipient of the Nobel Peace Prize in literature. Click on the links in the photographs for their source. Click on the links in the text for further information. Another great article Marc. You summed it up nicely by saying Dylan didn't care what guitar he was playing. I'm surprised you didn't elaborate on his "missing" Newport strat. I'm sure you know the story about where the pilot of his plane found it, attempted to return it, kept it in a closet for a few decades, and eventually his daughter had it authenticated and sold for close to a million USD. Thanks Henry for stopping by. I appreciate it. 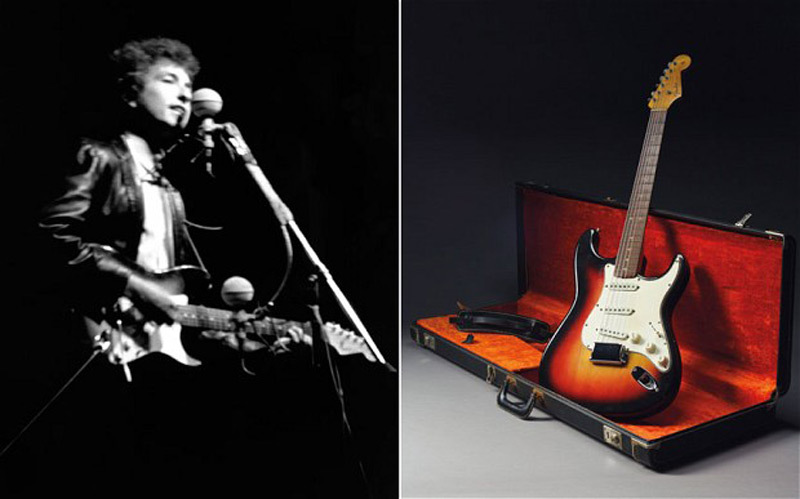 If you click on the text in the coloured picture of that Stratocaster, that says "The Strat Dylan Used in 1965", you will read the story from a Rolling Stone Magazine article. Great Article! You're right that he did not seem to care about what he played but man he really could play better then he is given credit for. He could really "drive" a song along better than most of the other folkies from back then. He was right up there as a great rhythm guitarist in the same way Lennon was. Thanks Glenn for you comments. His playing expertise is evident from the 1963 video where he is playing the old Washburn guitar. Once again click on the text. He was a grass-roots player and much better than some of his peers back in the day. Did you think about trading with the ultimate Bitcoin exchange company: Coinbase.